If you’ve been to a USHL game this month, you’ve probably noticed the officials sporting an extra stripe — one on their upper lip, that is. Many USHL officials are currently in their third week of sporting a mustache, or “lip sweater,” as some call it. During the month of November, many throughout the hockey community come together; standing up to cancer and raising awareness for men’s health. The officials are no different. The USHL officials have come together to support The Movember Foundation by growing mustaches during the month of “Movember.” The Movember Foundation raises awareness and funds that go towards research and outreach programs in four of the leading men’s health issues: prostate cancer, testicular cancer, mental health, and suicide prevention. While USHL officials have been growing mustaches during November for years, last year a few officials realized their whiskers could do more than just raise awareness. 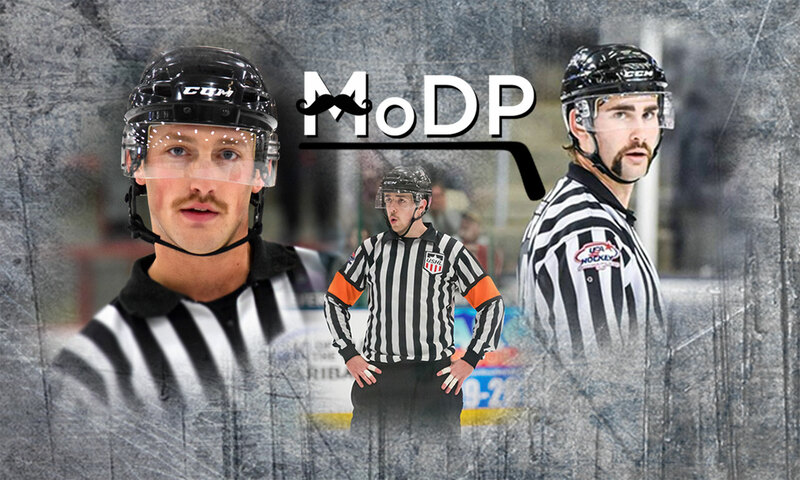 The USHL officials, who are also part of USA Hockey’s Officiating Development Program – ODP for short — created Team MoDP, a Movember team made up of current and former members of the ODP. During their first year the team raised over $5,500 for The Movember Foundation. Team MoDP, now in its second season, is hoping to further raise awareness while continuing to raise money for the cause. “It started last year after I spoke with a few guys on the officiating staff about the idea of trying to raise money for Movember. Given we already grew mustaches, this seemed like a really easy way for our staff to have a positive impact inside and outside of the hockey community. Everyone was really supportive,” said referee Brian Hankes, who has chosen to sport a “chevron-style” mustache this November. The Movember Foundation is a leading charity committed to changing the face of men’s health. Founded in 2003, the organization has funded more than 1,200 projects geared towards saving the lives of men all around the world. In the United States alone, Movember raised $17.1 million in 2017. Dwight Mack, a linesman sporting a "horseshoe or handle-bar” style mustache, decided to join the MoDP team after seeing the effects of cancer firsthand. “I’ve seen in my own family the battle people face going through cancer. I wouldn’t wish that upon anyone, so I want to do my part to work towards a world without cancer,” said Mack. “MoDP is 100% a team effort. A lot of the guys on the staff pitched in. Whether it was writing emails, posting about Team MoDP on social media or coming up with the logo, it was all important. It was awesome to see what we were able to raise in our first year for The Movember Foundation,” said Hankes. Although the officials aim to maintain a low profile on the ice during their games, they’re hoping to further spread the word in their second season with Team MoDP. “We’re hoping we can continue to raise money again this year for a cause that might truly benefit someone, maybe even save their life. We’d really appreciate the support of anyone who’d be willing to spread the word about Team MoDP or donate,” said referee Kevin Corbett. Whether you’ve never noticed the referees before, or chose to loudly voice your thoughts on their officiating, they’d truly appreciate anything you’d be willing to donate. All funds donated will go directly to The Movember Foundation, and will be applied to Team MoDP’s total for 2018. A link to Team MoDP’s fundraiser page can be found here.